Experience the diversity, color, and pure chaos that is India on a personal level. Our travel route will lead you on back roads to villages, cities, temples, palaces, abandoned fortresses, animals of the wild .India characterizes nature as it was intended : pure, untouched, energizing. Fly to the edges of frozen mountains, feel the primal legacy of dense forests, climb the crystalline glaciers, relax by the invigorating blue sea and venture into mystical and uninhabited deserts with our beaten track tours. 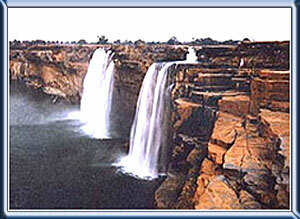 Welcomes to the newly formed Indian state Chhattisgarh. The mystical, the mythical, the historical & the natural, the whole world out there in the vast tracts of unpolluted, tranquil Chhattisgarh. Drive down to Jagdalpur. Overnight in Naman Baster. Visit of Bison Horn Maria and their colorful Dance at Guriapara, visit of Danteswari Mai Temple at Dantewada, Special Ganesh Temple at Barsoor and the Water Fall at Chitrakot. O/N. Hotel. Visit to the rich forests of Kanger valley National park, the enchanting Ttirathgarh Waterfall & the extraordinary stalactite and stalagmite caves are the highlights of this day. Early drive, 2 hrs, visit of Muria Villages at Baligaonpara and their colorful dance, visit of Iron & Dhokra Craft villages near Kondagaon. Thereafter proceed to Kanker. O/N. Hotel Lake View. Early drive [ 2 hrs] to Rajim to visit the Temple City of Rajim-Rajiv Loachan Temple & Someshwar Mahadeo Temple etc, then drive 1 hr to Raipur [ 50 km], Buffet Lunch and after Lunch Proceed to Kawardha [ 100 kms / 2 hrs. O/N at Palace Kawardha. Full day visit of Kawardha Surroundings like Bhoramdeo Temple, Madwa Mahal [ 20 kms from Palace & after Lunch visit of Baiga Tribe and enjoy their Dance at Dinner. Back to Kawardha and O/N.